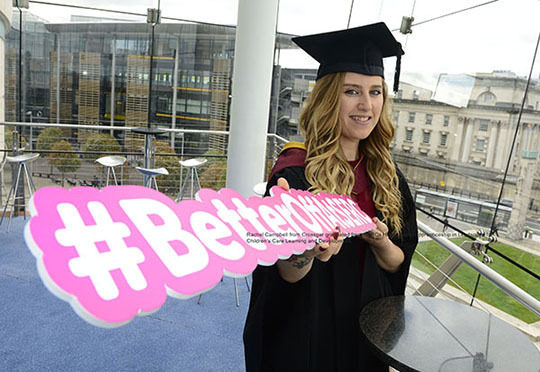 On Friday 7 September, a congregation of more than 1200 people crammed into the Belfast Waterfront Hall to celebrate the Higher Education successes of South Eastern Regional College (SERC) students. Joined together with family, friends and tutors, the ceremony celebrated the efforts and academic achievements of the ‘Class of 2018’. The event recognised the hard work and dedication of hundreds of full and part-time students. The ceremony honoured nearly 300 graduates and over twenty local businesses and featured an address from graduate Emma Cousins from the HND in advanced practice in work with children and families, and guest speaker Darragh McCarthy, CEO and Founder of Fintru. Crossgar student Rachel Campbell graduated in a Higher Level Apprenticeship in Leadership for Children’s Care, Learning and Development. Following the graduation ceremony, sixteen excellence awards were made, congratulating students on their enthusiastic approach to life and learning. These awards were established as an opportunity for SERC to honour and reward those students whose commitment to learning and training has set them apart from their peers. Twenty-six excellence awards were also presented to local businesses who have enriched the student learning experience through the provision of industry projects, educational visits and work placement opportunities. Finally, graduate Emma Cousins made the inspirational and emotional closing address, thanking SERC staff, fellow graduates’ and her family for their support. Emma said: “I would encourage others to consider SERC as their first option. I am delighted to have completed my course at SERC and would like to take this opportunity to thank all my lecturers who were very supportive and encouraging. Thanks to the skills and knowledge gained at SERC I received an offer to study Early Childhood Studies at Doncaster University with hopes to go on to study a master’s Degree in social work. With 97 percent of SERC students’ progressing into employment, self-employment or onto higher level courses on completion of their course, SERC is a great example of how the Further Education sector offers a real alternative to university for intelligent and ambitious people who want to work towards internationally recognised qualifications and a rewarding career.